Error ID: PRL_ERR_DISK_READ_FAILED (80021029), errno=60 (Operation timed out). If your Virtual Machine is on a network driver: make sure it is connected. for Mac OS X Lion and earlier: locate kernel log. Sep  2 12:59:11 <HOSTNAME> kernel: disk0s2: I/O error. Sep  2 12:59:25 <HOSTNAME> kernel: disk0s2: I/O error. NOTE: Instead of "path to the virtual machine" you need to write down the actual path to your virtual machine's .pvm bundle. You may also drag and drop your virtual machine's .pvm bundle to the Terminal window instead of typing the full path manually. It means your Virtual Machine is located on corrupted sectors of Macintosh HD and Mac OS X kernel cannot read its data from the drive. We strongly recommend to show your Mac to Apple because bad sectors may indicate a hardware problem and are likely to reappear. 3) If a new drive appeared in Finder, open it and copy folders that you need to Macintosh HD step-by-step (not all folders at once). Note: At this step some folders may fail to be copied. It means that they or their contents were corrupted. If you meet such a folder, open it and try to copy its contents the same way, step-by-step. 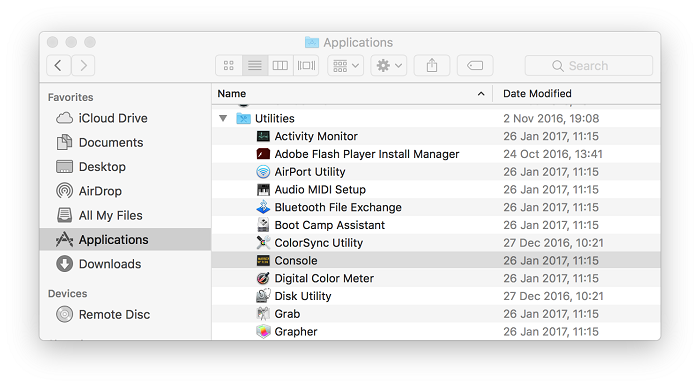 4) If no new drives appeared in Finder, it means the virtual machine's critical part was corrupted and there is no way to retrieve data from it using Parallels applications. Note: Regardless of a troubleshooting outcome the issue is not Parallels Desktop related and there are no further steps to be taken from the Parallels side. Locate your Boot Camp virtual machine .pvm file in Spotlight and move it to trash. Reinstall the Virtual machine from Boot Camp partition via Parallels Desktop upper menu -> File... -> New.